The board members are JoAnne Burek (President), Sandra Jenzen (Treasurer), Johanna Fischer (Secretary), Cindy Van Volkenburg (Membership Secretary), Ellen Homola (Trail Maintenance Coordinator), Anita Piebiak (Beyond Events), Lee Stickles (Webmaster and Hike Coordinator), and Directors at Large Jerry Shaw, Terry Elrod, Sherry Kunkel, and Carissa Wasyliw. Oscar Zawalsky talked about the Skyline Trail hikes that take place in the summer and Anita announced plans for the Beyond Event in the Nordegg Area this September. Order of the Laces, the award for most hikes attended, was won by David Mutch and Lee Stickles at 31 hikes each. If you see one of these cameras in the Edmonton area, wave hi! to the students who collect these images. 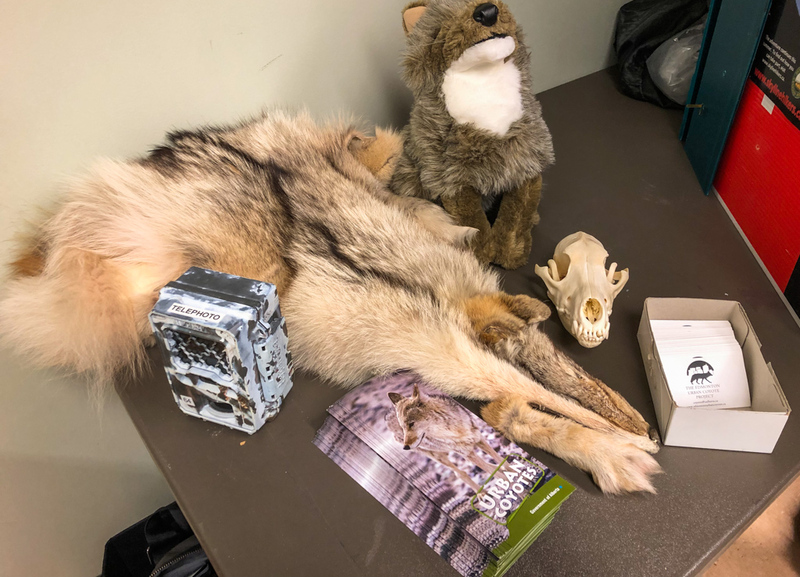 The guest speakers were Deanna Steckler and Cassie Stevenson, Masters students of Colleen St. Clair, speaking on “Adaptation, coexistence and conflict in urban coyotes”. 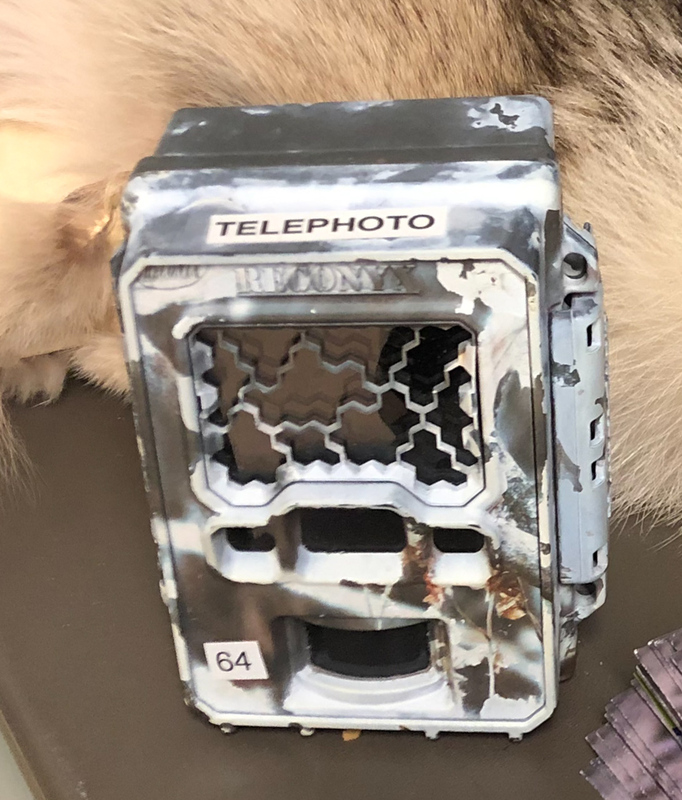 It was a jaw-dropping presentation that dispelled some myths and gave us new insights into the health and behaviours of the coyotes that live in the city and surrounding populated areas. Appreciate the coyotes who are here—we need to coexist. Besides, they are a great help in keeping the rodent population down. If coyotes are coming into your yard, check that your fencing is adequate, and that you’re not attracting them with food such as exposed compost and fruit fallen on the ground. Check that the space under your deck isn’t an attractive shelter. There is strong evidence that healthy coyotes stay in the natural areas and survive on mice and voles. The coyotes that wander the neighborhoods and eat compost and fallen fruit are highly likely to be sick with mange (caused by a parasite) and tapeworms. If a coyote does come into your area, try to scare it away by waving and yelling. Don’t let it become used to people. If you spot a coyote, the Edmonton Urban Coyote Project would like to know about it. Visit http://edmontonurbancoyotes.ca/reportsighting.php to report your sighting. An undergrad student gathers these notices and adds them to the research. Thanks to Deanna and Cassie for sharing the latest research findings and their ongoing activities in such an engaging way. We’d also like to thank Colleen St. Clair, PhD, for introducing us to these two enthusiastic speakers.